Welcome to Yardie Creek Boat Tours, a local tour business based in Exmouth, Western Australia (WA) that commenced tours from March 2013. The boat tour itself has a long history of operation within the Cape Range National Park, which is part of a World Heritage listed area on the North West (NW) Cape of WA. The boat tour is in the enthusiastic and knowledgeable hands of local husband & wife team Peter (Boxy) Maier and Mandy Francis-Maier, with Boxy* leading the boat tours and Mandy managing the office, bookings and marketing. Peter (Boxy) is a long-term resident of Exmouth with considerable tourism experience, current marine qualifications, extensive skippering expertise and a wealth of knowledge about the region. He has grown up, lived and worked in Exmouth for most of his life (+50 years), which brings a unique local flair to his tours and commentary. 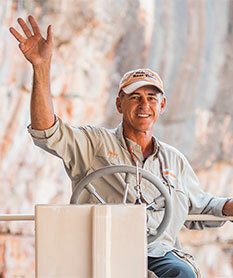 Boxy has been directly involved in the Exmouth fishing charter industry for over two decades, worked as a professional Firefighter and more recently worked with DPaW (for a year) as the boat tour guide for Yardie Creek, before starting their new business with Mandy – Yardie Creek Boat Tours. Boxy has a range of interests & hobbies he likes to “have a chat about”, ranging from game fishing, diving, go-karting, restoring cars & motorbikes, mountain bikes and more recently golf (joining Mandy in her sport of choice!). Also part of the YCBT Team is our tour guide Ashley (Ash) Broinowski! Ash is a local wildlife guide who has lived in the region for over 10 years is very passionate and particularly knowledgeable about birdlife in the region. 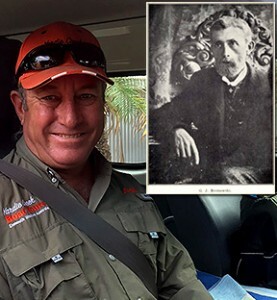 In this regard, he is following in his family heritage, as Ash’s great-grandfather was Gracius Joseph Broinowski, the (Polish-born) Australian artist, ornithologist and author of the well-known book “The Birds of Australia”. YCBT works closely with the Department of Biodiversity, Conservation and Attractions (DBCA) – formerly Department of Parks and Wildlife (DPaW) – in Exmouth and takes their responsibility of Environmental Stewardship in cooperation with DBCA very seriously. We have comprehensive Licence Conditions to operate under whilst on Yardie Creek and are regularly audited by DBCA. 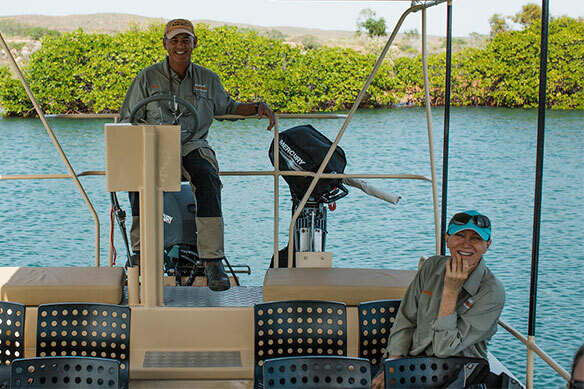 We are also the only licenced tour operator to do daily boat tours of Yardie Creek (based on our operating schedule). YCBT assists DBCA by providing wildlife data reports from the Creek on a routine basis, which assists with the ongoing research, monitoring and management of the area. We are very keen & passionate about protecting and maintaining Yardie Creek in it’s beautiful and pristine condition for now and into the future! YCBT supports the philosophy of low impact nature-based tourism and the boat tour is the epitome of this type of experience. The simple pleasure of being on a small, quiet vessel, cruising up the creek and absorbing the colours, sights and sounds of Yardie is a wonderful and relaxing experience. 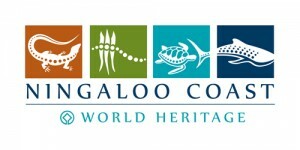 With relevant commentary to explain about the environmental, cultural, aboriginal history and local aspects and intrigues, we want our clients to leave the creek knowing a little bit more about Exmouth and the surrounding regions and the importance of protecting and preserving it for future generations. YCBT focuses on giving visitors/clients the opportunity to personally and directly experience nature at Yardie Creek. YCBT provides opportunities to experience nature in ways that lead to greater understanding, appreciation and enjoyment aboard “Yardi” during the boat cruise on the creek. YCBT aims to achieve best practice for environmentally sustainable tourism. YCBT considers that we positively contribute towards the conservation of natural areas in and around Yardie Creek. YCBT provides constructive ongoing contributions to the local community – we are proud to support local sporting groups, organisations & individuals fund-raising for worthy causes. YCBT aims to be sensitive to, interpret and involve the culture/s existing in the area. YCBT strives to consistently meet the expectations of our clients. YCBT is marketed and promoted honestly and accurately so that realistic expectations are formed.